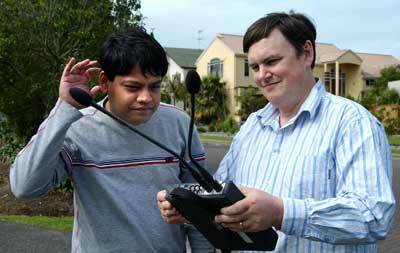 Massey University scientists Dr Fakhrul Alam and Dr Tom Moir with a high-sensitivity digital sound recorder. Listen to a simulation of the sound (most people won't be able to hear it, but if you play it in something like Windows Media Player and turn on the visualisation you will "see" the sound waves). Researchers have attracted widespread interest since they began investigating a mysterious humming noise in a house on Auckland's North Shore where only the householder can hear the sound. Although the pair of computer engineering scientists could not detect a humming sound when they visited the Brown's Bay house, they are now leading a growing investigation into reportings of unidentified sounds. Since local media reported that Massey scientists had been to investigate, Dr Tom Moir and Dr Fakhrul Alam have been inundated with phone calls from people reporting that they can hear hum-like noises that others with them cannot hear. Reports of hearing a hum, the Massey pair say, are a regular occurrence, world-wide. They are now preparing to investigate further, what they have dubbed, the Unidentified Acoustic Phenomena. Once the Brown's Bay 'hum' became publicised, the two were contacted by groups and individuals across the region, some of whom had been conducting their own investigations into the mysterious low level, background noises they say they can hear. The fact of the matter is that we do not yet have an answer as to why only some people hear these sounds, even though there has been keen interest and plenty of speculation world-wide on this phenomenon, says Dr Moir. At this stage we believe there are two possible explanations. The hum could be a very low frequency sound that only some people can hear. Or, it could be that microwaves in the atmosphere trigger a hum-like sound in the heads of some people that would not necessarily be heard by others or picked up by recording equipment. Dr Moir says his group hopes to learn more from the data they are now gathering and from the use of more sophisticated sound recording equipment capable of picking up low frequency sounds.